Singer/songwriter Richard Clapton is a popular and influential figure in Australian rock music. During a career spanning over three decades, he has had a string of hit songs including Girls on the Avenue, I am an Island, Capricorn Dancer and Deep Water. Affectionately known as “Ralph”, he is well respected by the music industry. He has worked with artists including INXS, Jimmy Barnes and Diesel and was inducted into the ARIA Hall of Fame in 1999. “He’s got great a personality and face for painting. He himself admits he’s no beauty but he’s a lovely man and I’ve always liked what he does,” says Alexander McKenzie, who grew up listening to Clapton in the 1980s. McKenzie went to Clapton’s studio for sittings, spoke to him a lot on the phone to get to know him better, and then did some drawings before embarking on the painting. Wanting to find an image to convey Clapton’s status in the music industry, he decided to portray him in the manner of a 19th century landowner. Hence the large-scale figure against the tiny landscape. It’s set at night because Clapton is a night person. Born in Sydney in 1971, McKenzie has lived and worked in the UK. Known primarily for his evocative landscape paintings, which radiate light and mood, he has had a string of successful exhibitions in Australia and the UK. 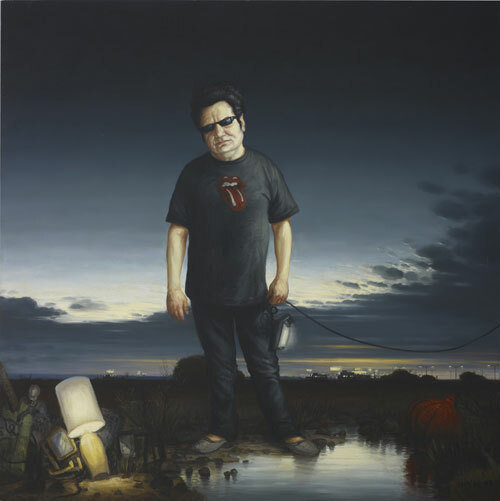 He has been a finalist in the Archibald Prize twice before with a portrait of singer/songwriter Sarah Blasko in 2008 and artist McLean Edwards in 2007. He was also in the Wynne Prize in 2005, 2006, 2007 and 2008.